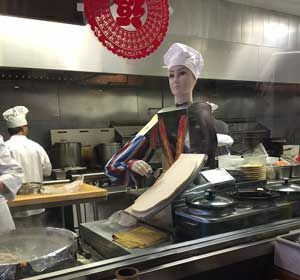 In many places in China and Japan - and now in Southern California - Chinese cooking, serving and noodle-cutting robots are entertaining customers and helping out in the kitchen. Are they of value? Certainly they attract and entertain customers. Do they perform a service that a restaurant would otherwise have to employ a human worker to perform? Do they copy the skills of an experienced restaurant worker. Do they have a positive return on their investment? Possibly. 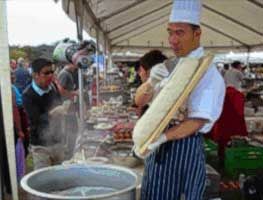 In the case of the noodle-cutter, this is an ergonomically challenging task to hold and position a few pounds of dough in one arm and intricately slice off noodles from that dough with the other. This is a extremely tiring task, albeit a skilled one. Chinese inventor and Beijing restaurant owner Cui Runquan invented a noodle slicing ’noodlebot' a few years ago and is now manufacturing and selling them for $2,000 each. As of mid-2012 he had sold over 3,000 of the devices. One of those devices is now at work at the Shanxi Noodle House in the San Gabriel Valley (a suburb of Los Angeles). Here's a picture I took of the robot at work at that restaurant followed by two videos about the process, the invention and inventor, and how the device works. Notice how similar the robot-looking device is to the human noodle cutter. It’s true that these noodlebots aren't really robots. But they are promoted as robots, perform robot-like tasks, and are having success both as a noodle cutter / labor-saving device AND as entertainment robots. Similar to robotic guides and kiosks, server and pickup robots are all the rage in China and are showing up in restaurants all over the country. It's hard to identify the vendors and even harder to determine whether these mobile devices are real robotic devices. In most of the pictures one can see a track that the server bots follow but because of language and other reasons it's hard to determine their level of autonomy, if any. Quieter inroads are being made in kitchens and food processing plants around the world as robotic meat cutting devices replace one of the most accident-prone tasks in the industry: meat cutting. In New Zealand, a land with a sheep population approximately seven times that of humans, robotic meat cutting has been a work in progress for many years. New Zealand lamb is big business and shipped frozen globally. RTL Robotic Technologies Leaders and Scott Technology, working together, have developed, over 10 years, safe and labor-free robotic systems for automating the meat cutting and boning process. Recently JBS, a large international meat processor and packing company headquartered in Brazil, acquired a majority share in Scott Technology and plans to bring the technology shown in this video to JBS production facilities in South and North America and Australia.